Fluke is a small iTunes plug-in for Mac OS X 10.6 and earlier version of Mac OS X that lets you play FLAC files at 16bit or 44.1KHz right within iTunes. The Fluke plugin cannot support embedded artwork and will not support playback FLAC files on iPod, iPhone, iPad, Airport Express or Apple TV. On Mac OS X 10.7 Lion, FLuke is limited to run in 32-bit Mode. To make Fluke run, go into /Applications/iTunes.app/Contents/MacOS/iTunes on your computer, then right-click on iTunes, head to Get Info, and check off “Open in 32-bit Mode”. Some users reported this trick won’t work for them. Mountain Lion users are not so lucky with Lion users in regards of playing FLAC in iTunes with Fluke as FLuke ceased to update for support of Mountain Lion and no trick works to get Fluke work in iTunes on Mountain Lion. To play FLAC in iTunes/iTunes 11 on Lion or Mountain Lion, a permanent and simple solution is to convert FLAC to iTunes 11 supported MP3. If you care the audio quality, you can convert FLAC to Apple Lossless or convert FLAC to WAV. 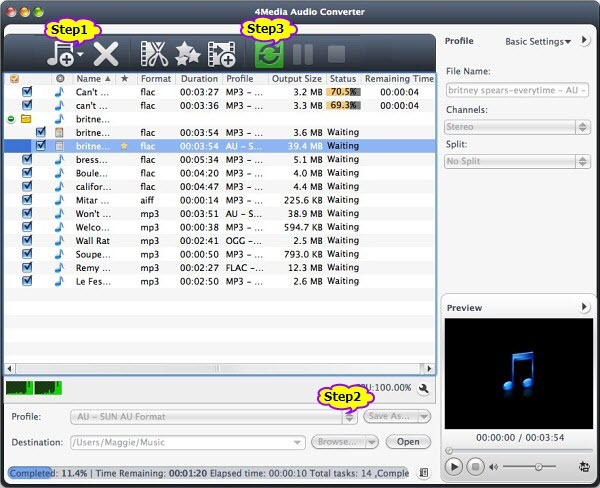 Make preparation: Free Download 4Media Audio Converter. Free download 4Media Audio Converter (for Windows, for Mac), install and run it. 4Media Audio Converter for Mac is an universal and versatile audio conversion software for Mac OS OX. It can convert between many audio files into MP3, WMA, WAV, AAC, FLAC, OGG, APE, AIFF, APE, BIK, VOC, SHN, QCP, Apple Lossless ALAC, RA, AU and etc formats and extract audios from video files like AVI, MPEG, WMV, MP4, FLV, MKV, H.264/MPEG-4 AVC and AVCHD. Click on “Profile” drop-down to choose desired output audio format. To convert FLAC to MP3, choose “MP3 – MPEG Layer-3 Audio”. To convert FLAC to Apple Lossless ALAC, choose “ALAC – Apple Lossless Audio”. To convert FLAC to WAV, choose “Wav – Waveform Lossless Audio”. With the audio converter, you can also convert FLAC to AIFF, AAC, AC3, M4A, DTS, M4A, RA, OGG, MP2, etc. Click on the “Convert” button start converting FLAC on Mountain Lion/Lion. After conversion is done, click “Open Folder” beside “Destination” at the bottom of the software to open the converted FLAC files. Then drag and drop them to add FLAC to iTunes/iTunes 11 on Lion/Mountain Lion. just downloaded and used your converter. works great! thank you very much for your work! Add Blu-Ray to iTunes 11 for Play,Transfer to iPad/iPhone/AppleTV How to Convert FLAC to 320kbps MP3 on Mac/Windows?